Cocktails	July 15, 2014 No Comments. Everyone has their favorite types of candy, but most people will agree on one thing: gummy worms are awesome. Far superior to gummy bears, gummy worms really need to be eaten in a couple bites, whereas gummy bears are usually a one bite type of deal. Also, the texture is much closer to a worm than a bear; worms make sense as a gummy candy, bears do not. Plain and simple. This crazy worm cocktail uses some pretty basic bar ingredients, so if you have a decent set-up at home already, you should be good to go. Just don’t forget the worms. In a cocktail shaker, add 1 1/2 oz. vodka, 2 oz. sweet sour, 1 oz. pineapple juice and some ice. Shake until chilled. Strain into a glass and add a splash of grenadine. Top with oodles of gummy worms in different colors. With these gummy worm cocktail gel shots, your entire drink will be as jiggly and fun as the gummy worms you’ll be enjoying. Spray a bunch of small shot glasses with cooking spray and set aside. Add 1/2 cup pineapple juice and 1/2 cup Sunny Delight to a saucepan. Sprinkle in 2 packages of unflavored gelatin powder, give a quick stir, and allow it to sit for a couple of minutes. Warm this mixture over low heat for about 5 minutes, long enough for the gelatin to completely dissolve. Remove your pan from the heat and stir in 1 small box of lime flavored gelatin dessert mix until it is dissolved. Add 1 cup of Pinnacle Gummy Vodka and stir. Pour the mixture into the shot glasses. Add one gummy worm candy into each shot glass and refrigerate until set, a minimum of two hours. 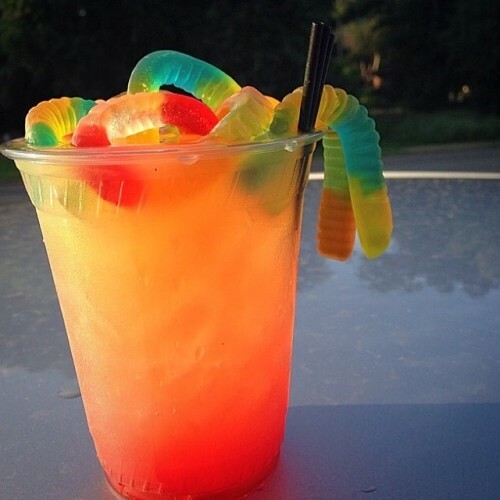 They try to make this cocktail sound like a creepy Halloween drink, but we see beyond its spooky facade: this is a delicious drink with adorable little gummy worms in it. In a pitcher, combine 1 1/2 cups of cold gin, 1 1/2 cups cold lemonade, and 2 cups of cold ginger ale soda. Add in a few drops of green food coloring until your desired color is reached. Mix again to combine. Place a tablespoon of whipped cream in the center of each cup and slowly pour the gin/soda mixture over the cream. Place 3 gummy worms in each cup. Embrace your inner candy lover and go for the gummy worms today.